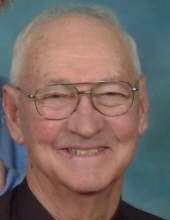 Donald W Funkenbusch, 86, of Maywood, Missouri, passed away Sunday, March 17, 2019, at Maple Lawn Nursing Home in Palmyra, MO. Funeral Services will be at 10:00 AM Friday , March 22, 2019 at Mt. Olivet United Methodist Church in Taylor, Missouri. Burial to follow with Full Military rites. Pastor Mark Carpenter and Pastor Jeff Voepel will Officiate. Visitation will be from 5:00 PM to 7:00 PM Thursday March 21st at Lewis Brothers Funeral Chapel. Donald was born May 19,1932 in Maywood, MO to Archie Lee and Florence Niekamp Funkenbusch. Donald was first married to Marjorie Stratton on May 19, 1951.She preceded him in death on October 22, 1988. Survivors include their three sons, Jeffrey Wayne Funkenbusch (Barb),Palmyra, Mo; Kirk Funkenbusch (Karen),Columbia, Mo; Scott Funkenbusch (Kelly), Maywood, MO. Grandchildren; Bradley Funkenbusch (Amber), Shelby Kenison (Jake), Kayla Marjorie Funkenbusch; William Funkenbusch (Danielle). Great grandchildren;Kaylee, Maddox, Ronan, Eleanna and one on the way.Also survived by one brother Dale Funkenbusch (Ann) Havanna, IL. He later married Norma Jean Martin Hagerty of Emerson on February 27,1993. She survives. Grandchildren; Seth Wilson (Mary); Caleb Wilson (Carrie); Leah Whipple (Ryan); Julia Jenkins (Brad); Amanda Amin (Mital); Andrea Wheeler, Matt Wheeler (Laura); Abby Bennett (Jon); Shane Meyers, Nathan Meyers (Brianna); Jaala Lewis (Jason), Janna Powell (J.P.); Jalene Tuley (Tate); Jordan Hagerty, Josh Hagerty, and James Hagerty. Great grandchildren; Ethan, Ezra, Norah, Summer, Solomon, Lucy, Annabelle, Lexi, Noah, Addison, Carson, Peyton, Kinsley, Jace, Haven, Levi, Penniah, Oren, Simi, Zoe, Lia, Hadley, Brynne, Ruby,and Naomi. Donald was preceded in death by his wife, parents, brother Roger Funkenbusch, sister Shirley Rathbun and two stillborn grandchildren, Brett Michael Funkenbusch and Brandon Lee Funkenbusch. Donald graduated from Palmyra High School in 1949. He served in the Army during the Korean Conflict. Professionally he was a life long Marion County farmer and worked for Electric Wheel for 20+ years until the business closed. Donald enjoyed reading local newspapers, farm magazines, Louis L'Amour westerns and riding around his farm on his Kubota. Baseball was a passion as he was an avid St. Louis Cardinals fan. He loved his family and especially spending time with his grandchildren. He was very proud of his family farm, Valley View Farm, which had just been designated as a Century Farm this month. Pallbearers will be Bradley Funkenbusch, Will Funkenbusch, Jake Kenison, Browny Rothweiler, Rusty Rothweiler, Jim Woodall and Mark Woodall. Honorary Pallbearers will be Sam Wilson, Jim Meyers, Michael Hagerty, Michael Stratton and Jason Stratton. To send flowers or a remembrance gift to the family of Donald Wayne Funkenbusch, please visit our Tribute Store. "Email Address" would like to share the life celebration of Donald Wayne Funkenbusch. Click on the "link" to go to share a favorite memory or leave a condolence message for the family.